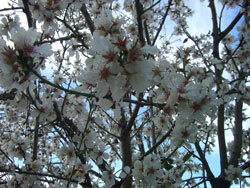 It is positively spring-like here in Andalucia. The blossom is out on the hillsides and we are walking everyday with the Bibsey in the backpack (an item right up there on our list of baby kit we could not have done without). And with the arrival of warmer weather comes more noise. Spain, I think, is notoriously noisy. Ploughing on, we also enjoy (or suffer – depending on your point of view) numerous fiestas during the year. So many in fact that I suspect even some of the Spaniards can’t keep up. Our lovely local shop keeper was gutted the other day when she realised she had been open on a holiday when she could have been having a nice day off. Semana Santa, that’s Easter week, is hugely important in Spain and is some kind of celebratory marathon in our village with endless fireworks and bangers that quite literally rocked the walls of our house. From what I could tell, the festivities started on Friday afternoon and ended when the sun came up and people had to go to work on Monday morning. There was a marching band that stopped in the the little plazeta outside our house at intervals during the weekend (starting at 8am on Saturday thank you very much) and the procession, involving the whole village, that filed past our window on the Sunday evening (this is an amazing spectacle). Oh, and incredibly, there was a foam party up the basketball courts. For Semana Santa 2010 we had a very small baby who seemed far less bothered about all the noise than we were. This year we are off to Portugal for the week. Best let them get on with it. There always seems to be some building project in progress. 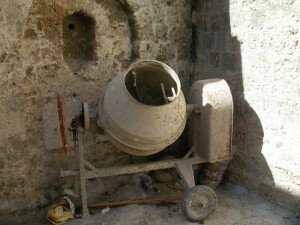 So Little B often finds herself drifting off to the sound of an angle grinder or cement mixer. And finally, there is another maddening aspect to the noise issue that I should mention briefly (and that I am sure will merit its own post/angry rant at some point), and that is that effing dog! There is a nasty little dog that comes here for the summer and various weekends (often coinciding with fiestas) to terrorise the neighbourhood. It barks unabated at every person, animal and vehicle that passes and it bites! And this, my friends, is the icing on the noisy cake. We hate that dog. Our neighbours hate that dog. It is so hated that I almost feel sorry for it.